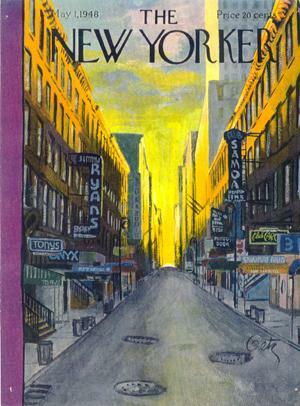 is best known as the most prolific cover artist of The New Yorker magazine. Over a 50 year period, 1938 to 1988, a total of 213 Getz covers appeared on the magazine. In addition to his success as an illustration artist, Getz was a passionate and prolific fine artist, working with a variety of mediums and styles over his lifetime. He painted cityscapes and landscapes, drew political cartoons, wrote and illustrated children's books, and explored mediums and techniques such as etching, encaustic, and ink brush drawing. Copyright 1948 The New Yorker. Its use is courtesy of The New Yorker. No reproduction or distribution of this material may be made except with the written permission of The New Yorker.